The organic beets at Whole Foods were simply gorgeous over the weekend, and when I saw them I realized that I hadn't cooked any beets at all this year. I knew I had to do something about that, so I put a bunch in my basket. Also into my basket went a large fennel bulb, which also looked particularly good. I had a vague idea of some kind of salad. I grabbed the dill because I was thinking about making dill rice. But then I realized I was making fried rice and would not need to dill. It was a natural leap to combine it with the beets and fennel. I already had a shallot, and thought I might be able to use orange juice instead of sugar for a fresh dressing, and toasted pistachios might add texture in addition to that rich flavor. it worked beyond my wildest dreams. Soaking the shallots in red wine vinegar pickles them for a tart burst of flavor. The sweetness of the beets is all the sugar that is necessary to round out the dressing, and the orange juice really shines against the fennel. The dill adds a grassy freshness and the occasional pistachio adds a satisfying crunch and nuttiness that seals the deal. If these are the only beets I eat all year, they will be well worth it. If you are only going to eat beets once this year, make this salad. You will not regret it. It's actually satisfying enough on its own to make a light lunch with a nice crusty piece of bread, but it would be a beautiful accompaniment to any main dish. Trim the stem end of the beets (saving the greens for another use if they are still attached). Leave about one inch of the stems and do not cut the roots. Place in a 3-quart saucepan and fill with cold water to cover. Bring to a boil, then lower the heat and simmer until a knife goes in cleanly and comes out easily. Let cool, then trim the ends and peel them. Put the shallot in a small bowl with the red wine vinegar and let sit while the beets are cooking. Chop the stems off of the fennel bulb. Cut the bulb in half and remove the core by cutting a triangle out of the bottom center. Cut the pieces in half again and slice them as thinly as you are able. After the beets have cooled and they are peeled, cut them into quarters and then slice the quarters about 1/4-inch thick. Remove the shallots from the vinegar, saving the vinegar, and put them in a large bowl. 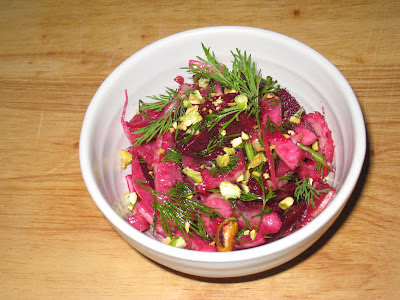 Add the fennel and beets and stir just enough to combine. Add the juice from the orange to the red wine vinegar in the small bowl. Season to taste with salt. Slowly pour in the olive oil, whisking it constantly. Pour the dressing over the beets and fennel and stir gently to make sure everything has been well coated with the dressing. Add the dill. Add a few of the pistachios to each individual portion as it is served, to keep them from getting soggy in the dressing.